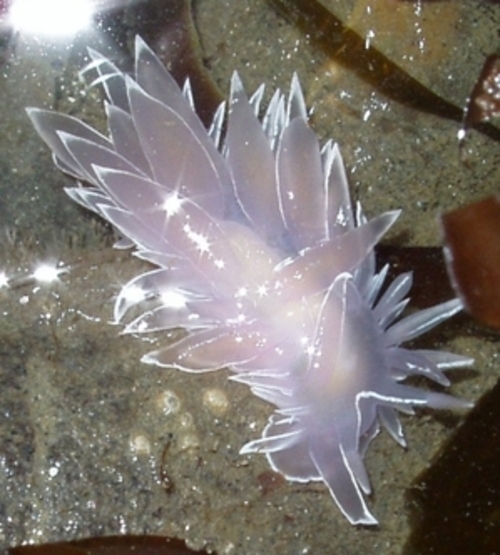 One of our most exciting tide-pool finds last year was the Alabster Nudibranch, "Dirona albolineata". We were tide-pooling at Sisters Rocks, 15 miles north of Gold Beach, in August during a good low-tide (-1.4). We spotted this white, fairy-like critter (see below). Its cerata, the leaf-like projections, looked like translucent wings outlined in white (albolineata translates: white line). I sent an inquiry to the Nudibranch Forum, hosted by the Australian Museum, and they identified the little guy for me. Since that day, we have found many more specimens (the two below were spotted 10 miles north of Gold Beach, at the base of Devil's Spine). The Alabaster is found in rocky intertidal areas, as well as sub-tidally, from southern California to Alaska. It is an opportunistic predator that feeds on a wide variety of prey, including bryozoans, small crustaceans, small snails, and hydroids, depending upon which is the most abundant. They can grow up to 7 inches long sub-tidally, but the ones pictured in both photos were less than 2 inches long.